Most scientists have long assumed that life on Earth is a homegrown phenomenon. According to the conventional hypothesis, the earliest living cells emerged as a result of chemical evolution on our planet billions of years ago in a process called abiogenesis. The alternative possibility--that living cells or their precursors arrived from space--strikes many people as science fiction. Developments over the past decade, however, have given new credibility to the idea that Earth's biosphere could have arisen from an extraterrestrial seed. Planetary scientists have learned that early in its history our solar system could have included many worlds with liquid water, the essential ingredient for life as we know it. Recent data from NASA's Mars Exploration Rovers corroborate previous suspicions that water has at least intermittently flowed on the Red Planet in the past. It is not unreasonable to hypothesize that life existed on Mars long ago and perhaps continues there. Life may have also evolved on Europa, Jupiter's fourth-largest moon, which appears to possess liquid water under its icy surface. Saturn's biggest satellite, Titan, is rich in organic compounds; given the moon's frigid temperatures, it would be highly surprising to find living forms there, but they cannot be ruled out. Life may have even gained a toehold on torrid Venus. The Venusian surface is probably too hot and under too much atmospheric pressure to be habitable, but the planet could conceivably support microbial life high in its atmosphere. And, most likely, the surface conditions on Venus were not always so harsh. Venus may have once been similar to early Earth. Moreover, the expanses of interplanetary space are not the forbidding barrier they once seemed. Over the past 20 years scientists have determined that more than 30 meteorites found on Earth originally came from the Martian crust, based on the composition of gases trapped within some of the rocks. Meanwhile biologists have discovered organisms durable enough to survive at least a short journey inside such meteorites. Although no one is suggesting that these particular organisms actually made the trip, they serve as a proof of principle. It is not implausible that life could have arisen on Mars and then come to Earth, or the reverse. Researchers are now intently studying the transport of biological materials between planets to get a better sense of whether it ever occurred. This effort may shed light on some of modern science's most compelling questions: Where and how did life originate? Are radically different forms of life possible? And how common is life in the universe? To the ancient philosophers, the creation of life from nonliving matter seemed so magical, so much the realm of the gods, that some actually preferred the idea that ready-made living forms had come to Earth from elsewhere. Anaxagoras, a Greek philosopher who lived 2,500 years ago, proposed a hypothesis called "panspermia" (Greek for "all seeds"), which posited that all life, and indeed all things, originated from the combination of tiny seeds pervading the cosmos. In modern times, several leading scientists--including British physicist Lord Kelvin, Swedish chemist Svante Arrhenius and Francis Crick, co-discoverer of the structure of DNA--have advocated various conceptions of panspermia. To be sure, the idea has also had less reputable proponents, but they should not detract from the fact that panspermia is a serious hypothesis, a potential phenomenon that we should not ignore when considering the distribution and evolution of life in the universe and how life came to exist specifically on Earth. In its modern form, the panspermia hypothesis addresses how biological material might have arrived on our planet but not how life originated in the first place. No matter where it started, life had to arise from nonliving matter. Abiogenesis moved from the realm of philosophy to that of experimentation in the 1950s, when chemists Stanley L. Miller and Harold C. Urey of the University of Chicago demonstrated that amino acids and other molecules important to life could be generated from simple compounds believed to exist on early Earth. It is now thought that molecules of ribonucleic acid (RNA) could have also assembled from smaller compounds and played a vital role in the development of life. In present-day cells, specialized RNA molecules help to build proteins. Some RNAs act as messengers between the genes, which are made of deoxyribonucleic acid (DNA), and the ribosomes, the protein factories of the cell. Other RNAs bring amino acids--the building blocks of proteins--to the ribosomes, which in turn contain yet another type of RNA. The RNAs work in concert with protein enzymes that aid in linking the amino acids together, but researchers have found that the RNAs in the ribosome can perform the crucial step of protein synthesis alone. In the early stages of life's evolution, all the enzymes may have been RNAs, not proteins. Because RNA enzymes could have manufactured the first proteins without the need for preexisting protein enzymes to initiate the process, abiogenesis is not the chicken-and-egg problem that it was once thought to be. A prebiotic system of RNAs and proteins could have gradually developed the ability to replicate its molecular parts, crudely at first but then ever more efficiently. This new understanding of life's origins has transformed the scientific debate over panspermia. It is no longer an either-or question of whether the first microbes arose on Earth or arrived from space. In the chaotic early history of the solar system, our planet was subject to intense bombardment by meteorites containing simple organic compounds. The young Earth could have also received more complex molecules with enzymatic functions, molecules that were prebiotic but part of a system that was already well on its way to biology. After landing in a suitable habitat on our planet, these molecules could have continued their evolution to living cells. In other words, an intermediate scenario is possible: life could have roots both on Earth and in space. But which steps in the development of life occurred where? And once life took hold, how far did it spread? Scientists who study panspermia used to concentrate only on assessing the basic plausibility of the idea, but they have recently sought to estimate the probability that biological materials made the journey to Earth from other planets or moons. To begin their interplanetary trip, the materials would have to be ejected from their planet of origin into space by the impact of a comet or asteroid. While traveling through space, the ejected rocks or dust particles would need to be captured by the gravity of another planet or moon, then decelerated enough to fall to the surface, passing through the atmosphere if one were present. Such transfers happen frequently throughout the solar system, although it is easier for ejected material to travel from bodies more distant from the sun to those closer in and easier for materials to end up on a more massive body. Indeed, dynamic simulations by University of British Columbia astrophysicist Brett Gladman suggest that the mass transferred from Earth to Mars is only a few percent of that delivered from Mars to Earth. For this reason, the most commonly discussed panspermia scenario involves the transport of microbes or their precursors from Mars to Earth. NASA's Long Duration Exposure Facility carried spores of the bacterial species Bacillus subtilis (inset) in orbit for six years. Researchers found that a thin aluminum cover was enough to shield the spores from damaging ultraviolet radiation, enabling 80 percent of them to survive. Simulations of asteroid or comet impacts on Mars indicate that materials can be launched into a wide variety of orbits. Gladman and his colleagues have estimated that every few million years Mars undergoes an impact powerful enough to eject rocks that could eventually reach Earth. The interplanetary journey is usually a long one: most of the approximately one ton of Martian ejecta that lands on Earth every year has spent several million years in space. But a tiny percentage of the Martian rocks arriving on Earth's surface--about one out of every 10 million--will have spent less than a year in space. Within three years of the impact event, about 10 fist-size rocks weighing more than 100 grams complete the voyage from Mars to Earth. Smaller debris, such as pebble-size rocks and dust particles, are even more likely to make a quick trip between planets; very large rocks do so much less frequently. Could biological entities survive this journey? First, let us consider whether microorganisms could live through the ejection process from the meteorite's parent body. Recent laboratory impact experiments have found that certain strains of bacteria can survive the accelerations and jerks (rates of changes of acceleration) that would be encountered during a typical high-pressure ejection from Mars. It is crucial, however, that the impact and ejection do not heat the meteorites enough to destroy the biological materials within them. Planetary geologists formerly believed that any impact ejecta with speeds exceeding the Martian escape velocity would almost certainly be vaporized or at least completely melted. This idea was later discounted, though, following the discovery of unmelted, largely intact meteorites from the moon and Mars. These findings led H. Jay Melosh of the University of Arizona to calculate that a small percentage of ejected rocks could indeed be catapulted from Mars via impact without any heating at all. In short, Melosh proposed that when the upward-propagating pressure wave resulting from an impact reaches the planetary surface, it undergoes a 180-degree phase change that nearly cancels the pressure within a thin layer of rock just below the surface. Because this "spall zone" experiences very little compression while the layers below are put under enormous pressure, rocks near the surface can be ejected relatively undeformed at high speeds. Next, let us consider survivability during the entry into Earth's atmosphere. Edward Anders, formerly of the Enrico Fermi Institute at the the University of Chicago, has shown that interplanetary dust particles decelerate gently in Earth's upper atmosphere, thus avoiding heating. 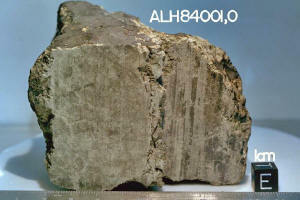 Meteorites, in contrast, experience significant friction, so their surfaces typically melt during atmospheric passage. The heat pulse, however, has time to travel a few millimeters at most into the meteorite's interior, so organisms buried deep in the rock would certainly survive. Over the past five years a series of papers by one of us (Weiss) and his colleagues analyzed two types of Martian meteorites: the nakhlites, a set of rocks blasted off Mars by an asteroid or comet impact 11 million years ago, and ALH84001, which left the Red Planet four million years earlier. 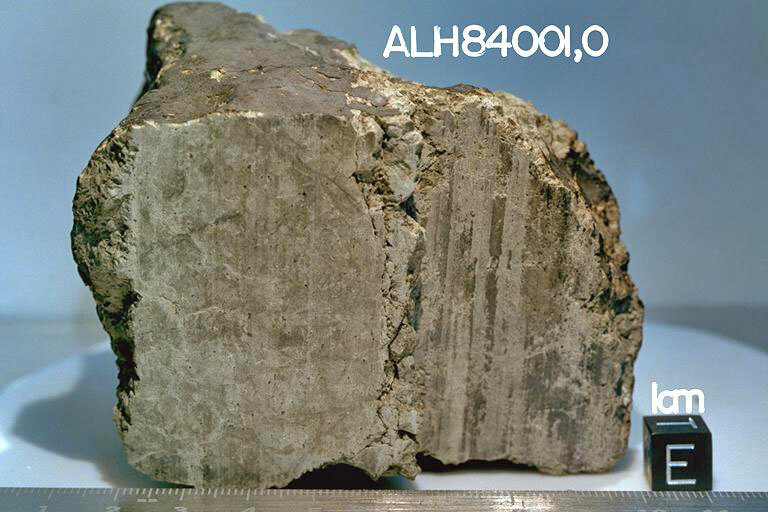 By studying the magnetic properties of the meteorites and the composition of the gases trapped within them, Weiss and his collaborators found that ALH84001 and at least two of the seven nakhlites discovered so far were not heated more than a few hundred degrees Celsius since they were part of the Martian surface. Furthermore, the fact that the nakhlites are nearly pristine rocks, untouched by high-pressure shock waves, implies that the Martian impact did not heat them above 100 degrees C.
Many, though not all, terrestrial prokaryotes (simple one-celled organisms such as bacteria that lack a membrane-bound nucleus) and eukaryotes (organisms with well-defined nuclei) could survive this temperature range. This result was the first direct experimental evidence that material could travel from planet to planet without being thermally sterilized at any point from ejection to landing. For panspermia to occur, however, microorganisms need to survive not only ejection from the first planet and atmospheric entry to the second but the interplanetary voyage itself. Life-bearing meteoroids and dust particles would be exposed to the vacuum of space, extremes in temperature and several different kinds of radiation. Of particular concern is the sun's high-energy ultraviolet (UV) light, which breaks the bonds that hold together the carbon atoms of organic molecules. It is very easy to shield against UV, though; just a few millionths of a meter of opaque material is enough to protect bacteria. 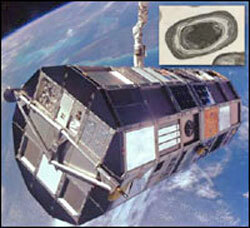 Indeed, a European study using NASA's Long Duration Exposure Facility (LDEF), a satellite deployed by the space shuttle in 1984 and retrieved from orbit by the shuttle six years later, showed that a thin aluminum cover afforded adequate UV shielding to spores of the bacterial species Bacillus subtilis. Of the spores protected by the aluminum but exposed to the vacuum and temperature extremes of space, 80 percent remained viable -- researchers reanimated them into active bacterial cells at the end of the mission. As for the spores not covered by aluminum and therefore directly exposed to solar UV radiation, most were destroyed, but not all. About one in 10,000 unshielded spores stayed viable, and the presence of substances such as glucose and salts increased their survival rates. Even within an object as small as a dust particle, solar UV would not necessarily render an entire microbial colony sterile. And if the colony were inside something as large as a pebble, UV protection would be sharply increased. Informative as it was, the LDEF study was conducted in low Earth orbit, well within our planet's protective magnetic field. Thus, this research could not say much about the effects of interplanetary charged particles, which cannot penetrate Earth's magnetosphere. From time to time, the sun produces bursts of energetic ions and electrons; furthermore, charged particles are a major component of the galactic cosmic radiation that constantly bombards our solar system. Protecting living things from charged particles, as well as from high-energy radiation such as gamma rays, is trickier than shielding against UV. A layer of rock just a few microns thick blocks UV, but adding more shielding actually increases the dose of other types of radiation. The reason is that charged particles and high-energy photons interact with the rocky shielding material, producing showers of secondary radiation within the meteorite. These showers could reach any microbes inside the rock unless it was very big, about two meters or more in diameter. As we have noted above, though, large rocks make fast interplanetary voyages very infrequently. Consequently, in addition to UV protection, what really matters is how resistant a microbe is to all components of space radiation and how quickly the life-bearing meteorite moves from planet to planet. The shorter the journey, the lower the total radiation dose and hence the greater the chance of survival. In fact, B. subtilis is fairly robust in terms of its radiation resistance. Even more hardy is Deinococcus radiodurans, a bacterial species that was discovered during the 1950s by agricultural scientist Arthur W. Anderson. This organism survives radiation doses given to sterilize food products and even thrives inside nuclear reactors. The same cellular mechanisms that help D. radiodurans repair its DNA, build extra-thick cell walls and otherwise protect itself from radiation also mitigate damage from dehydration. Theoretically, if organisms with such capabilities were embedded within material catapulted from Mars the way that the nakhlites and ALH84001 apparently were (that is, without excessive heating), some fraction of the organisms would still be viable after many years, perhaps several decades, in interplanetary space. Yet the actual long-term survival of active organisms, spores or complex organic molecules beyond Earth's magne-tosphere has never been tested. Such experiments, which would put the biological materials within simulated meteoritic materials and expose them to the environment of interplanetary space, could be conducted on the surface of the moon. In fact, biological samples were carried onboard the Apollo lunar missions as part of an early incarnation of the European radiation study. The longest Apollo mission, though, lasted no more than 12 days, and samples were kept within the Apollo spacecraft and thus not exposed to the full space-radiation environment. In the future, scientists could place experimental packages on the lunar surface or on interplanetary trajectories for several years before returning them to Earth for laboratory analysis. Researchers are currently considering these approaches. Meanwhile a long-term study known as the Martian Radiation Environment Experiment (MARIE) is under way. Launched by NASA in 2001 as part of the Mars Odyssey Orbiter, MARIE's instruments are measuring doses of galactic cosmic rays and energetic solar particles as the spacecraft circles the Red Planet. Although MARIE includes no biological material, its sensors are designed to focus on the range of space radiation that is most harmful to DNA. As we have shown, panspermia is plausible theoretically. But in addition, important aspects of the hypothesis have made the transition from plausibility to quantitative science. Meteorite evidence shows that material has been transferred between planets throughout the history of the solar system and that this process still occurs at a well-established rate. 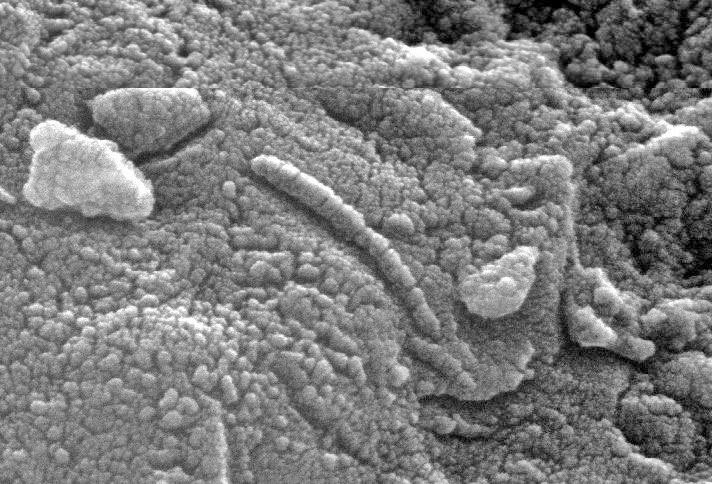 Furthermore, laboratory studies have demonstrated that a sizable fraction of microorganisms within a piece of planetary material ejected from a Mars-size planet could survive ejection into space and entry through Earth's atmosphere. But other parts of the panspermia hypothesis are harder to pin down. Investigators need more data to determine whether radiation-resistant organisms such as B. subtilis or D. radiodurans could live through an interplanetary journey. And even this research would not reveal the likelihood that it actually happened in the case of Earth's biosphere, because the studies involve present-day terrestrial life-forms; the organisms living billions of years ago could have fared much worse or much better. Moreover, scientists cannot quantify the likelihood that life exists or once existed on planets other than Earth. Researchers simply do not know enough about the origin of any system of life, including that of Earth, to draw solid conclusions about the probability of abiogenesis occurring on any particular world. Given suitable ingredients and conditions, perhaps life needs hundreds of millions of years to get started. Or perhaps five minutes is enough. All we can say with any certainty is that by 2.7 billion years ago, or perhaps several hundred million years earlier, life-forms were thriving on Earth. Because it is not possible at this time to quantify all the steps of the panspermia scenario, investigators cannot estimate how much biological material or how many living cells most likely arrived at Earth's surface in a given period. Moreover, the transfer of viable organisms does not automatically imply the successful seeding of the planet that receives them, particularly if the planet already has life. If, for example, Martian microbes arrived on Earth after life independently arose on our planet, the extraterrestrial organisms may not have been able to replace or coexist with the homegrown species. It is also conceivable that Martian life did find a suitable niche on Earth but that scientists have simply not identified it yet. Researchers have inventoried no more than a few percent of the total number of bacterial species on this planet. Groups of organisms that are genetically unrelated to the known life on Earth might exist unrecognized right under our noses. Ultimately, scientists may not be able to know whether and to what extent panspermia has occurred until they discover life on another planet or moon. For example, if future space missions find life on the Red Planet and report that Martian biochemistry is very different from our own, researchers would know immediately that life on Earth did not come from Mars. If the biochemistries were similar, however, scientists might begin to wonder if perhaps the two biospheres had a common origin. Assuming that Martian life-forms used DNA to store genetic information, investigators could study the nucleotide sequences to settle the question. 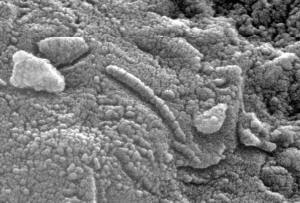 If the Martian DNA sequences did not follow the same genetic code used by living cells on Earth to make proteins, researchers would conclude that Mars-Earth panspermia is doubtful. But many other scenarios are possible. Investigators might find that Martian life uses RNA or something else entirely to guide its replication. Indeed, yet-to-be-discovered organisms on Earth may fall into this category as well, and the exotic terrestrial creatures might turn out to be related to the Martian life-forms. Whether terrestrial life emerged on Earth or through biological seeding from space or as the result of some intermediate scenario, the answer would be meaningful. The confirmation of Mars-Earth panspermia would suggest that life, once started, could readily spread within a star system. If, on the other hand, researchers find evidence of Martian organisms that emerged independently of terrestrial life, it would suggest that abiogenesis can occur with ease throughout the cosmos. What is more, biologists would be able to compare Earth organisms with alien forms and develop a more general definition of life. We would finally begin to understand the laws of biology the way we understand the laws of chemistry and physics - as fundamental properties of nature. Worlds in the Making: The Evolution of the Universe. Svante Arrhenius. Harper, 1908. The Structural Basis of Ribosome Activity in Peptide Bond Synthesis. P. Nissen, J. Hansen, N. Ban, P. B. Moore and T. A. Steitz in Science, Vol. 289, pages 878-879; August 11, 2000. 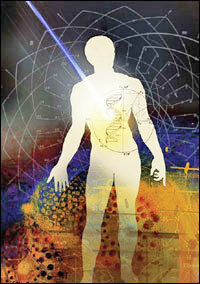 Risks Threatening Viable Transfer of Microbes between Bodies in Our Solar System. C. Mileikowsky, F. A. Cucinotta, J. W. Wilson, B. Gladman, G. Horneck, L. Lindegren, H. J. Melosh, H. Rickman, M. Valtonen and J. Q. Zheng in Planetary and Space Science, Vol. 48, Issue 11, pages 1107-1115; September 2000. Martian Surface Paleotemperatures from Thermochronology of Meteorites. D. L. Shuster and B. P. Weiss in Science, Vol. 309, pages 594-600; July 22, 2005. Origins of the Genetic Code: The Escaped Triplet Theory. M. Yarus, J. G. Caporaso and R. Knight in Annual Review of Biochemistry, Vol. 74, pages 179-198; July 2005.